Your Oriental rug is a valuable investment. With proper care, it will provide you with generations of use and enjoyment. Our expert Oriental rug cleaning services in San Marino are aimed at meeting the needs of each individual rug we care for. 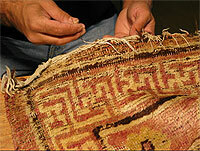 We do our best to protect, preserve and enhance the investment in your valuable rug. We offer pick-up and delivery in the San Marino area.